Wind Upon Wind Upon Wind! – Run. Ride. Roam. Wind Upon Wind Upon Wind! I fear this blog is fast becoming little more than a weather report! Will this wind never let up? It is ferocious, relentless and seemingly never ending. The riding would be absolutely perfect if this unwanted intrusion in the form of howling gales would just go away. 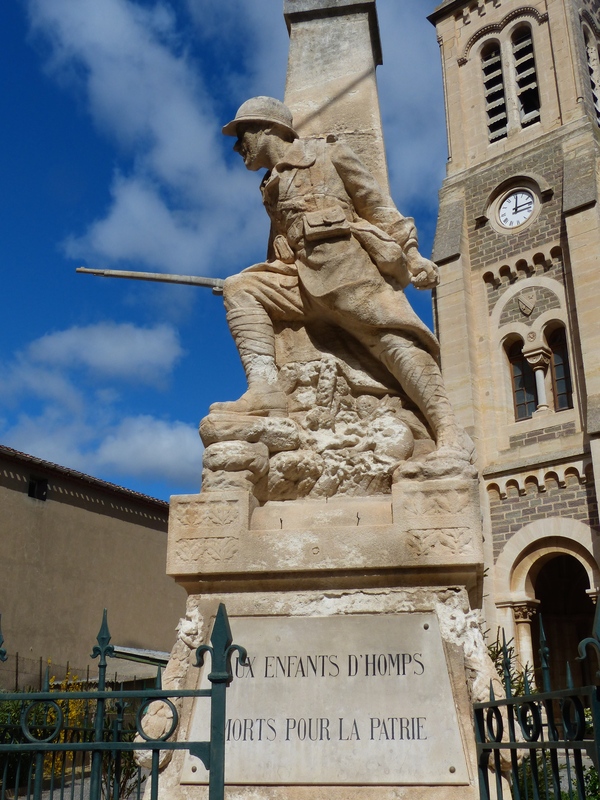 As we left our nice B&B in Le Somail, after a nice relaxing breakfast that included multiple cups of tea, we headed off towards our next destination, Olonzac. The wind seemed to have eased slightly and we were optimistic that today’s ride may be a little more pleasant. 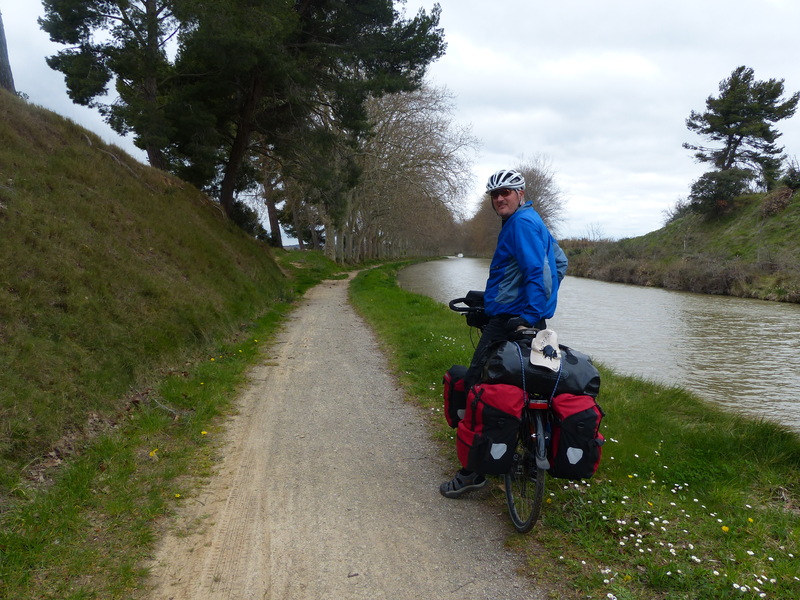 We cycled onto the path beside the canal and were soon met with a gate blocking any further progress, so with a quick recalculation, we headed onto the road. I could see machinery where the path ran above the road, so I think they may have been doing maintenance on the canal path. Not to worry though, the road was a quiet country one and not too much traffic, so all was well. The wind blew to blazes though and a darn headwind again! It makes it a little hard to look at the scenery for the wobble prone rider such as I, because a turn of the head, combined with a cross-wind is bound to result in a swerve of gargantuan proportions. So I look at the scenery up ahead and through peripheral vision, all of which is scenic and lovely, but just not quite as expansive as one would like, given the limitations of the unskilled rider of the bike! 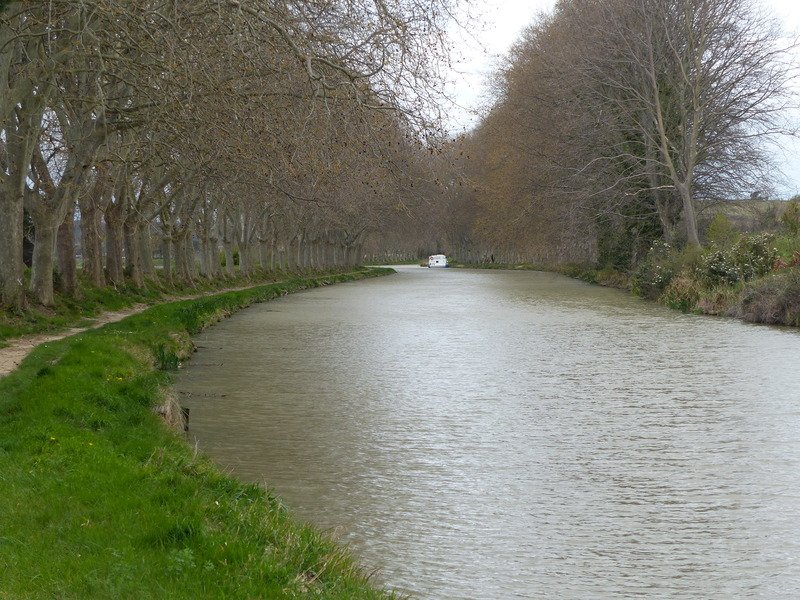 We were soon able to return to the canal path, so we could ride beside the water and wave to the folks touring the Canal du Midi in style and luxury on their boats. 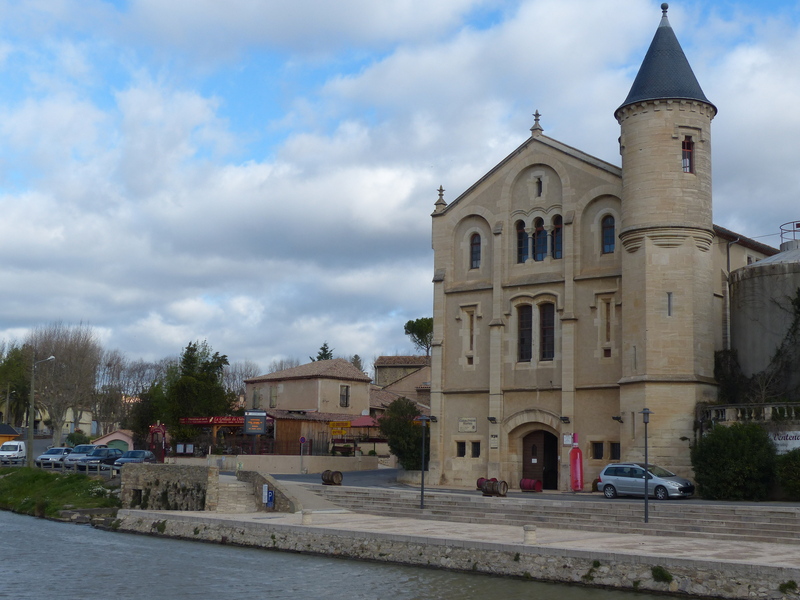 We passed the same family we had seen yesterday, when we stopped beside the canal and had lunch by the bridge. Yesterday they were in the process of opening the lock and motoring through and today we saw them again, cruising up the waterway. As we rode along the path, the wind howled and roared through the trees and I was just hoping very hard, that these were not the type of trees that dropped their branches in a breeze, because we were a moving, but sitting duck target for any of those swaying and creaking limbs above us. Thankfully, we rode through with not so much as a splinter. 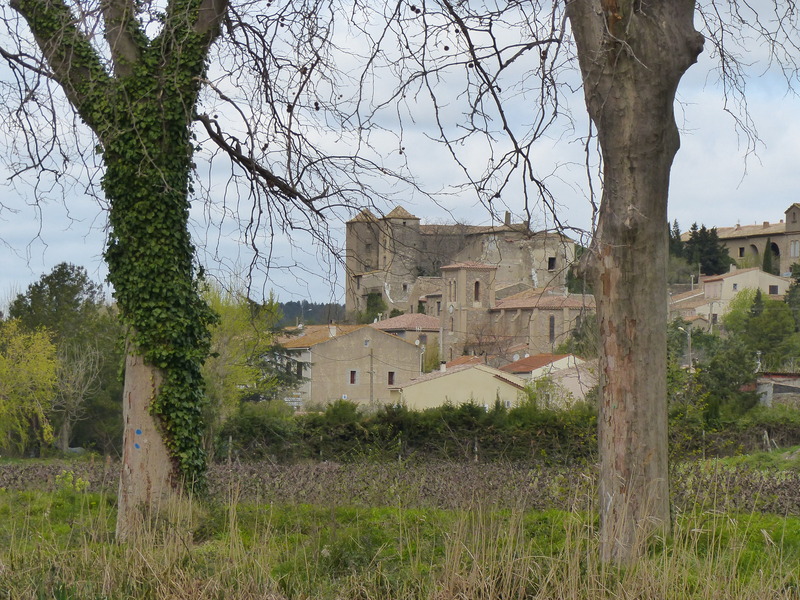 We rode through some lovely little villages, just the sort of places you would see on a postcard, an oil painting or an episode of ‘Allo, ‘Allo! They were old and rustic and quaint and historic and beautiful. It was along this ride and through these villages that I was again reminded of the amazing talents of imbalance and steering that I have on the bike. I seem to be a magnet for anything with a bump! As we were riding out of one of the villages, we were riding down a perfectly smooth, sealed street, but there was one pothole right in the middle. Just one hole and not on the side of the street, where a vehicle or bike should be travelling, but in the middle of the street. Who do you think rode through that pothole!? How could I do that? It just seems that if there’s something there to ride into, over or through that a cyclist should avoid, I’m going to make a beeline for it, whether I like it or not. So…BUMP went I through that pothole and I rode on with a shake of my head, perplexed at how my skills could be so incredibly appalling! Further on, the path beside the canal became very narrow, narrow to the point of about car tyre width, with grass and tussocks either side. Where did I ride? Bump-bump-bump-bump…along the grass and tussocks and lumpy ground! I focused and slowed and did my darndest to stay on the smoother bit of track and avoid riding over all the lumpy tussocks, but for the most part I was off-roading along every bit of lumpy ground that was there to be ridden on! I guess the wind shear from the monumental cross-winds didn’t help, but still… It’s the same when I ride at home, I can be riding along a perfectly flat bush track and there will be a tree root off to the side and for some reason, my steering takes me straight over that big tree root. If there’s a smooth road or track and a big rock in the middle, I will hit that rock and ride over it! It’s yet another supreme talent of mine, to take the path most lumpy and to continue to break records for the cyclist with the steering abilities of a blindfolded wombat on a pogo stick! 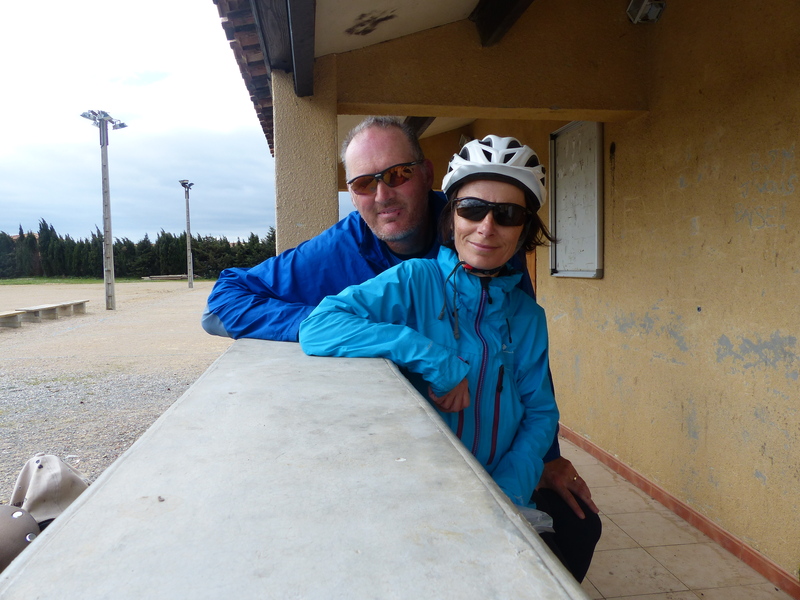 We stopped in the little village of Roubia for elevenses and discovered the sports ground, with its clubhouse that offered a bit of shelter from the wind, so we parked there for a quick break. 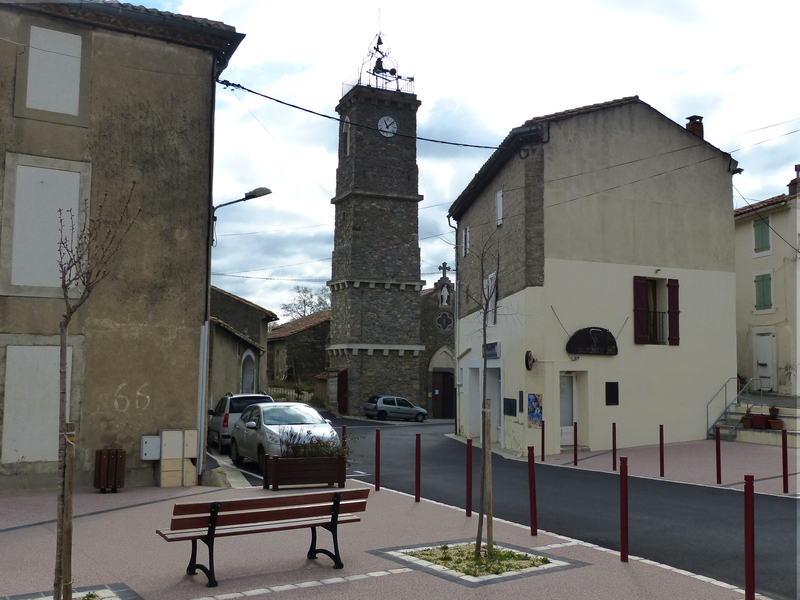 We knew we were going to arrive in Olonzac in good time, because we had planned a shorter ride, due to having to contend with the wind, so it was a leisurely elevenses, with a bit of respite from the wind. As we rode on and passed people walking, we did get some stares, quite possibly because we did look like a pair of wallies out on a bike in a howling gale, wobbling and swerving with every gust that blew us around. I took to smiling broadly and giving a very happy sounding “Bonjour” to all that passed by. I tried, with just my face to give the impression that it was a lovely day for cycling and what a tip-top time we were having. In my mind’s eye I tried to look like someone from a 1970’s TV commercial for laundry detergent, pedalling serenely along in a flowing white cotton dress, a broad brimmed straw hat, sandalled feet bronzed and pedicured and dusky blue eyeshadow glinting in the sun. That’s the look I was trying to convey to all passers-by, with my smiles and cheerful outward appearance, something other than the reality of a huffing, wobbling, swerving middle-aged loony in a helmet, rain jacket and socks and sandals out for a day of endurance in gale force winds! I like to think I succeeded in giving the impression I was striving for! We indeed arrived in Olonzac nice and early after about 25km of riding. All in all, the conditions weren’t as bad as we had endured on other days, but the wind was still mighty fierce, so the shorter ride and early arrival was still welcome. We rode around the small village and found that our accommodation didn’t open until 4:00, so we had three hours to wait. 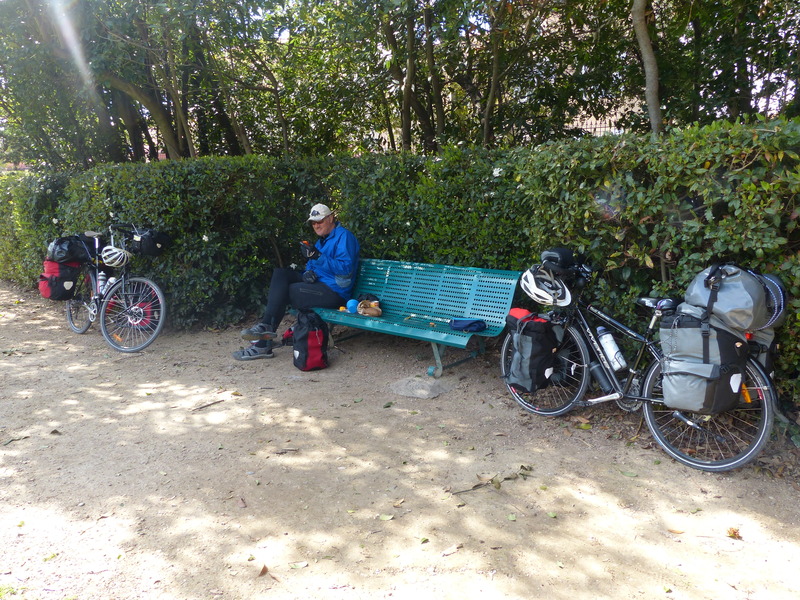 We rode out to a supermarket, so Steve could replenish his honey supply for smothering on his bread and I grabbed some fruit and we headed back into the village to try and find somewhere out of the wind to have some lunch. We found the municipal park and gardens and it was a lovely spot. We found a piece of hedge that offered some shelter and settled in for a long and leisurely lunch, fired up the Trangia for a cup of tea and sat back to watch the world go by. Yes, this could possibly be described as merely killing time, but I really enjoyed it. So many of our days have been full days on the bike, with a quick 10 minute stop for elevenses and a quick 15 minute stop for lunch and then back on the bikes to get where we need to go. Rarely do we really take time to just sit and relax. So, to do that today, even in the wind, was a real treat I thought. We took our time lunching and then sat in the sun and soon enough it was time to pedal back to our B&B. We were greeted by the owner, a very nice and friendly lady, who spoke very little English, which was fine because we speak very little French, but we got by. She showed us to our second storey room, which involved navigating some very narrow, steep and winding steps, lugging four panniers and a large bag each. After a bit of heaving and puffing we got to the top though and found a lovely cosy little room waiting for us. Since we had arrived in good time, I decided it was time I went for a run. My running has been sadly on hold for longer than I would have liked, due to weather and time and locations, so I decided to tackle the wind again and head out for a plod. Steve sat back in the town gardens again and waited while I ran into the nearby village of Homps and back again. Even on feet, I was swerving at times when the wind grabbed me and gave me a shove, but I was just glad to be getting in a run. So once again, today was a lovely ride, just spoiled somewhat by the annoying wind. I’m loving the flat paths and the delightful little villages and the scenic countryside and today I actually consciously reminded myself, “I am here. I am in France. 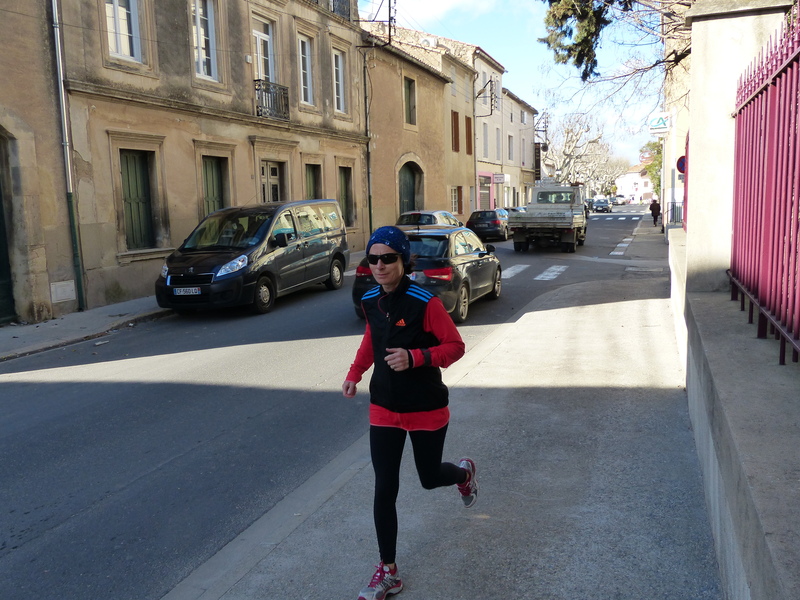 I am actually doing this in France” because I felt really lucky to be here. Despite several weeks on the road now, I am still wobbling, still swerving, still riding over every lump, bump or hole that appears in front of me, but I’m bumping and swerving and wobbling in Europe, in some amazing places. How awesome is that! Plus, some people can claim supreme skills and abilities on a bike, whereas my superpowers are quite unique…the most supreme wobbler, swerver and bump magnet on the road! I’m taking calls if anyone wants lessons in those super skills! I just have to get rid of my competition and I’ll be Number 1 champion for those abilities…now where is that blindfolded wombat on the pogo stick, so I can give him a shove?! Hey Heidi – maybe you should AIM FOR THE potholes and bumps ….. then you would be fine hahahaha. Good thinking 99! I shall aim for them from now on! This sure is something you could do and should do! I’m a total wimp, so you could do it sure as eggs is eggs! Sounds like you’re not letting the wind dampen your spirits. Keep pedalling hard. One more day of school left here and then it’s holidays. The wind is a total pain, but no, we’re trying not to let it spoil things. Have a great Easter and fantastic holiday!